If you’ve got glucose-6-phosphate dehydrogenase deficiency*, or if you generally just don’t like falafel, you might still enjoy this dish! Traditional falafel is made out of fava beans and deep fried, and personally I’m not a huge fan of fava beans or deep frying things. So when I found this recipe for a healthy version of falafel made out of pinto beans, I knew I’d be in love. Plus this gave me another excuse to make my own pita bread, and it came out so much better the second time! Watching pita bread puff up in the oven is one of the coolest baking experiences EVER! I had made this once before, and I wanted to make it again since I’ve been on such a “bean kick” lately. Unfortunately, I tried using a cast iron skillet this time and the patties really stuck to the pan. Because of the small amount of oil used to cook these, you really need a non-stick skillet. Using the right pan, these patties are a cinch to throw together, and another easy weeknight meal. I almost didn’t post this because I had a lot of trouble taking a picture of it that looked appetizing. But I couldn’t bare not sharing it with you because I think it’s such a unique dish! It really adds some variety to the weekly menu, and seems fancy while actually being really easy! I hope you try it, despite the bad pictures. *G-6-Phosphate Dehydrogenase deficiency is a common x-linked disorder, in which affected persons can have attacks of hemolytic anemia brought on by fava beans (as well as infections and certain medications). Sorry for being a dork, just trying to be educational around here. – Makes enough for about 4 pita halves. 1. First make the avocado spread by mixing all ingredients in a small serving dish. 2. To make the patties, combine all patty ingredients in a large mixing bowl. 3. Preheat oil a large non-stick skillet over medium-high heat. 4. Combine mashed pinto beans, Monterey jack cheese, crushed tortilla chips, cilantro, green onion, cumin and egg white in a mixing bowl. 5. Form the pinto bean mixture into patties and place them in the oil in the large skillet. 6. Cook patties for 3 minutes on each side, or until brown and heated through. 7. 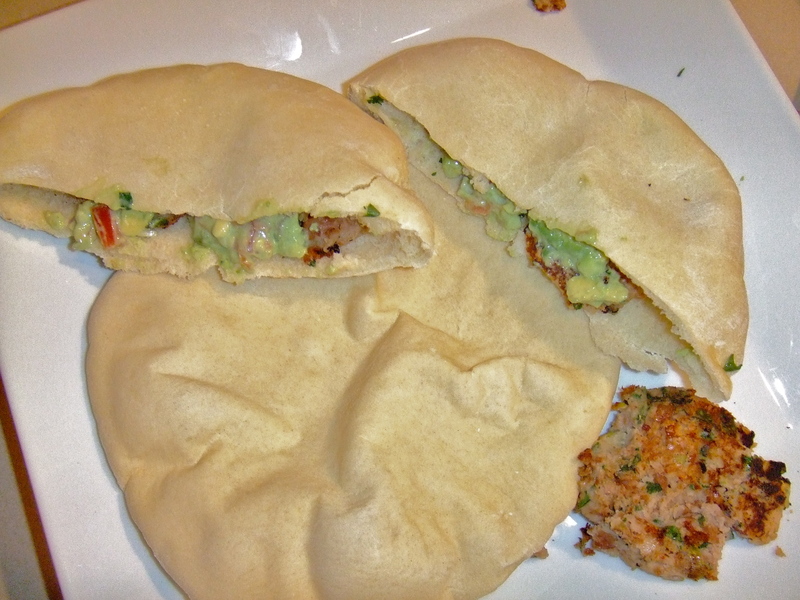 To serve, place 2-3 patties in a pita half, and top with avocado spread and any other desired vegetables. This entry was posted on February 16, 2011 by Spice Is Nice. It was filed under Easy Weeknight Dinners, Main Dish, Vegetarian . I made the pizza yesterday – it was DELICIOUS!! This looks like a really interesting take on falafel! I think I’ll try it out soon, but I have an avacado-hater in the house – any other suggestions on a sauce to top it with? Hmm, I might suggest salsa mixed with sour cream instead. Or just salsa. I’m very excited to see that you have started adding medical knowledge to your blog; now it’s like I’m studying for the boards WHILE I read your recipes! What an awesome combo!